Going on adventures as a solo female traveler can be a fun way to test your limits and fuel your soul. When you venture out into the world as a solo female traveler you may have some concerns that make you anxious about traveling alone but rest easy, traveling as a solo female can be an amazing adventure. 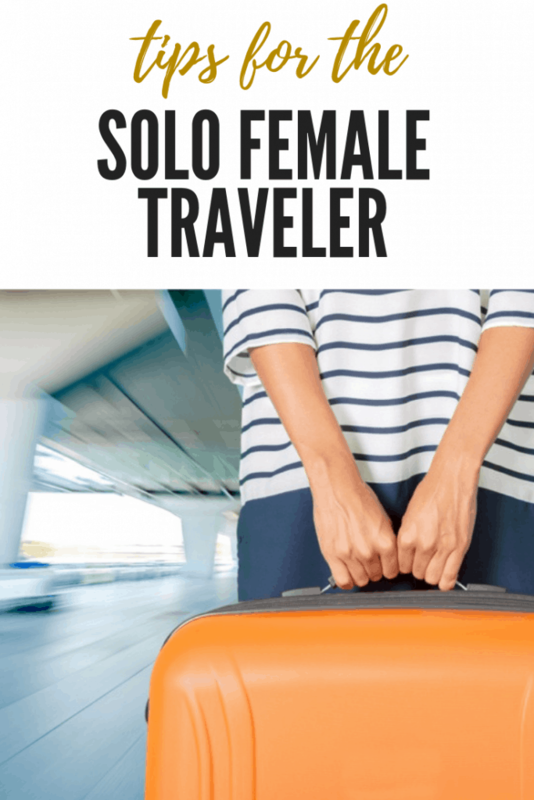 Today I’m featuring tips for the solo female traveler so that you can see the advantages of traveling alone and how to be safe while being a solo female traveler. One of the best things about being a solo female traveler is that you’re completely alone. This means you won’t have anyone distracting you from listening to your gut. While traveling solo you’ll be more aware of your surroundings with fewer distractions. My number one tip for the solo female traveler is to trust your intuition at all times. If something seems too good to be true, it just might be. If a person or place feels creepy, then don’t go around that person or place. Trusting your intuition may mean you miss out on a couple of things, but it will keep you safe while traveling solo. Be sure that you’re first night is all set up prior to traveling to your destination. Make sure you call ahead to book your first night stay wherever you’re traveling to. In addition to having your accommodations pre-arranged be sure that you have a way to get from the airport to your hotel or motel so that you can arrive safely and settle in. Pre-arranging your accommodations as a solo female traveler is the best way to remain safe while traveling alone. You may opt to pre-arrange your taxi from the airport to your accommodations ahead of time as well to cut down time once you arrive. When venturing to different regions of the world it’s important to know the culture and expectations. Some cultures see an outgoing female as too forward and this could turn into a bad experience when traveling alone. Research the cultural expectations of females when you’re traveling so that you’re aware of what type of clothing, how much eye contact to make and how outgoing and chatty to be as a means to respect the culture of the region that you’re traveling to. When you’re a solo female traveler it’s important to be aware of any cultural differences so that you don’t offend the wrong people. When you’re a solo female traveler you get to do whatever you want. There’s no friends or family members holding you back, there’s no taking turns so that everyone can try something new. When you opt to travel alone you get to do anything you want. Take this time to do something new and exciting. Get out of your comfort zone while traveling solo so that you can make the absolute best of this time alone. There are so many things you can do when you’re a solo female traveler, make a bucket list and start checking off items on your list. Traveling solo can be a fun experience for anyone and while it does leave you some chances to learn and experiment with what works best for you, the ultimate benefit of being a solo female traveler is that you get to boost your confidence and enjoy travel on your terms.